After speaking with my therapist on Wednesday, I decided I was sick of waking up every day and worrying about a problem, a situation, a person that was bothering me, or feeling guilty for no reason. Instead of being a worrier, I decided I was going to be a problem solver. The first step in solving a problem is having the courage to admit there is one. And the next step is trying to figure out the best way to approach the situation or person, which isn't always easy. If you know me, you know that confrontation is something I usually avoid and try to stay away from. I am instead, the person who usually goes along with whatever it is, but then spends hours afterward complaining about it, trying to analyze the situation or person, and feeling really angry. I am proud to say that since last Wednesday I have problem solved more than once. I am gradually beginning to "face my fears". I am seeing myself changing and growing. 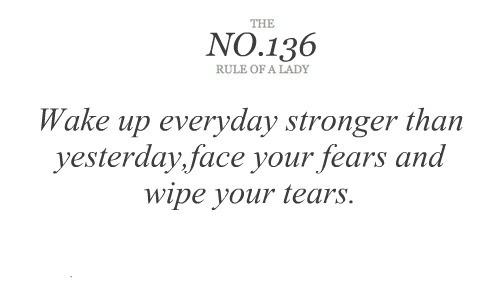 Less tears, more confidence. Less worry, more happiness. I'm finding it is better to get a problem out in the open, rather than to feel guilty about it, be scared of it, or talk about it to someone else.